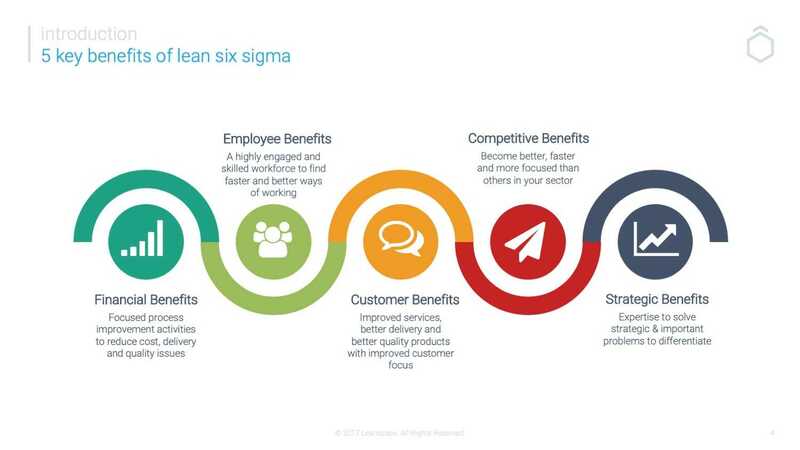 So what are the business benefits of Lean Six Sigma? Lean Six Sigma is not particularly new but at the same time, it’s still poorly understood. Companies continually set up Project Management Offices to manage the initiatives not knowing if the projects they are managing are the right ones or even worse if the project’s solution is the right one. Lean and Six Sigma do just this. These five benefits above are ordered in the way they appear to the business once the business undertakes the beginnings of lean six sigma training and a focused program. You do not have to look far to see how Lean Six Sigma has been used to drive extraordinary financial benefits within leading companies worldwide. GE, Motorola and Honeywell are well-known examples but today you can find companies like Amazon, Apple, Kimberly Clark, Lego, Xerox, BAE and Hertz all developing their Lean Six Sigma programs with success. The initial financial benefits come from the projects candidates undertake as part of the Lean Six Sigma training program. When we mentor candidates, we work with the company to identify projects which are important to the business as such we target around 20x ROI on average. So for a training that costs $2000, we are expecting a project to deliver somewhere around $40,000 saving on average with a single batch on average achieving around $350K. And this is just from the first project. If candidates continue to run 2 to 3 projects across the year, the value that Lean Six Sigma programs offer during the first couple of years can easily transform balance sheets. These savings are real and tangible and not just “the best guess” by an employee and their manager. Any potential savings are clearly identified early on in the project and then validated by your finance team. Lean Six Sigma rests on data-driven decision making and as such almost all project will have either actual cost savings or at the bare minimum cost avoidance metrics. While financial benefits are not everything as we discuss below, its easy to see how quickly lean six sigma programs which are correctly managed and supported through mentoring gather momentum quickly. Two well-used quotes come to mind. “Look after your employees and they will look after your customers” and “Train your employees so well that they can leave, treat them so well that they don´t want to.” both by Richard Branson. Without a doubt, Lean Six Sigma is one of the most valuable pieces of training you can give your employees. The training helps them helps accelerate their business acumen but it also develops a wide range of soft skills from change management to critical thinking and analysis, from complex problem-solving skills to leadership and influence skills. Today, more than ever before, investing in your employees is a must and the skills learnt through the training and the project delivery help candidates develop to become better managers and leaders. From a recent survey we ran, 9 out of 10 people recommend Lean Six Sigma as a way to improve their careers. Without a doubt, one of the biggest benefits we see is that as employees get involved to solve issues and take ownership of the improvements, we quickly see a rise in employee engagement which spans out across the organisation. The entire Lean Six Sigma methodology starts with understanding the customer. When looking at a process, the first thing candidates are taught is to identify who is the customer of the process and what is it they actually want? Without understanding this, it’s impossible to understand where the issues are and what they can do to solve it. At the start, projects may be internally focused, but even so, improvements in the performance of the company will begin to be seen and felt by your customers. As the program matures, more projects can be selected along the value chain which is closer to the customer. The goal of Lean Six Sigma is to deliver greater customer value by removing waste from all and every process. Therefore, before you know it, customers will be involved, suppliers will be involved and the goal is that the entire supply chain is working together to maximise the benefits to customers with the most efficient processes possible to maximise returns. As you improve your underlying financial situation and engaged employees drive customer-focused improvements, the goal is to differentiate your performance from your competitors. Getting new customers is much harder than retaining existing customers as we all know. Also, with better-designed processes which have great flexibility, lean organizations are much quicker and better at adapting to changes in customers demands. With a focus on the customer running across your entire team, you are much closer to the customer and more capable to understand their needs and adapt. This in itself differentiates your organization from your competitors. Companies who have deployed Lean Six Sigma quickly see it’s strategic benefits with both short-term strategic actions and longer-term strategic goals. The skills and training developed at Green Belt and perhaps Black Belt level quickly help target important strategic projects with a depth of problem-solving capability which is key to success. With the training received, it’s less about fire-fighting and survival, but solving problems for good to lay the foundation for the right investments to be made and for time, money and resource allocation to be correctly deployed to make those long-term strategic initiatives a reality.